If you can't see the above video you need to download Adobe Flash Player. Click here to download for free. The Battle of Binh Ba was one of the major battles fought by Australians during the Vietnam War. Like the Battle of Long Tan and the Battle of Coral/Balmoral, Binh Ba was one of only five battles to be recognised during the Vietnam War with the award of a battle honour to the participating units. In May/June 1969, North Vietnamese and Viet Cong main force units had infiltrated in strength into Phouc Tuy province to demonstrate they could do so without significant resistance from Australian forces who at that time had been operating in adjacent provinces. In early June, 6RAR had deployed along Route 2 to the north of the village of Binh Ba. 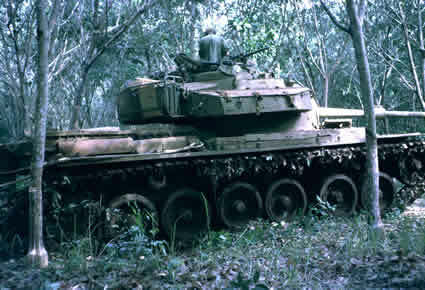 On the morning of 6 June, a centurion tank and an armoured recovery vehicle were travelling from Nui Dat north along Route 2 when they were fired upon near Binh Ba. One vehicle was extensively damaged. As 6RAR was fully committed and not in a position to react, the 1ATF Ready Reaction Force was deployed from Nui Dat. It consisted of D Coy 5RAR, one troop of B Sqn 3 Cav Regt and one troop of B Sqn 1 Armd Regt. A short time later B Coy 5RAR was also deployed form Nui Dat and CO 5RAR moved forward to assume command of the operation – code named Operation HAMMER. 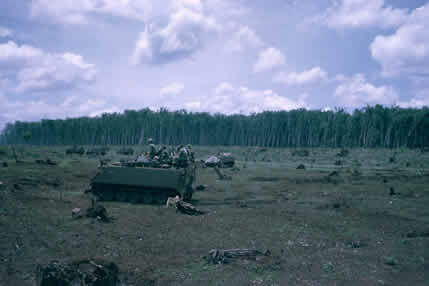 Just prior to midday, the Ready Reaction Force with tanks leading and D Coy 5RAR mounted in APC’s assaulted Binh Ba from east to west. During this phase elements of infantry had to dismount and shepherd civilians from the danger zone. This initial sweep into the village encountered strong enemy resistance. One tank was crippled by RPG fire and its wounded crew rescued. At the same time bushranger gunships of 9 Sqn RAAF engaged enemy in other parts of the village. After 90 minutes of fierce fighting and with ammunition running low the assault force broke out of the village to the south. At about 1420 hours 6 June D Coy, dismounted and supported by a fresh troop of tanks and with APC’s in the rear, assaulted Binh Ba from west to east. Blocking positions comprising B Coy 5RAR and Vietnamese Army troops were established to the north and east of the village. Heavy close quarter fighting took place as the D Coy house clearing teams encountered fierce opposition. Many houses were neutralised with the firepower of the armoured vehicles which allowed the infantry to enter and clear each house progressively. Several hundred hand grenades were thrown at the enemy in the underground rooms of each house. This stage of the fighting was of an intensity rarely equalled during any period of Australia’s involvement in the Vietnam War. Heavy enemy casualties were inflicted and it was also the period when most Australian casualties occurred. By 1830 hours and with the battle effectively won, the assault force reached the eastern side of the village. 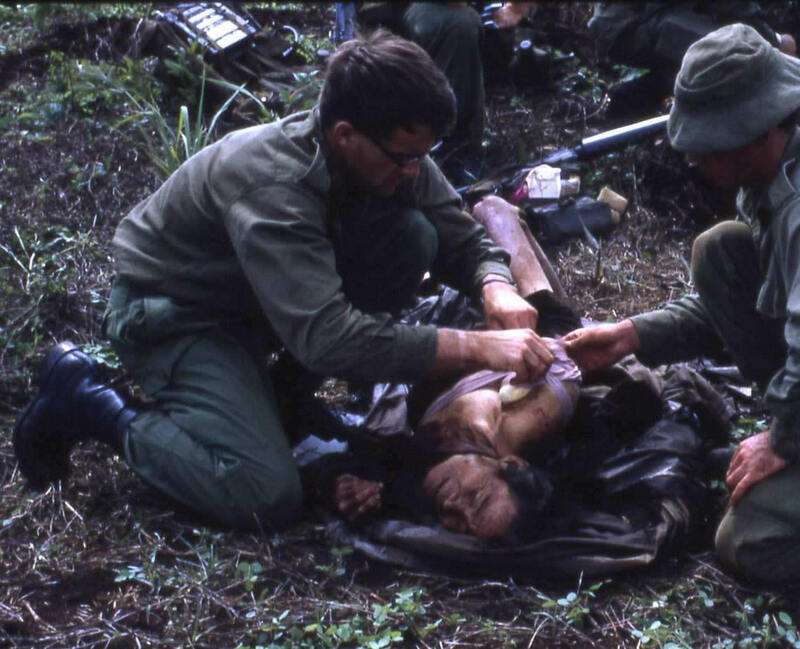 Early morning on 7 June, B Coy repulsed a North Vietnamese Army reinforcement force to the south-west of Binh Ba. At 0950 hours, D Coy (reinforced with a platoon from B Coy) dismounted and leading tanks and APC’s, began a further sweep through Binh Ba from west to east. At 1300 hours on 7 June 100 enemy overran Duc Trung a hamlet 500 metres to the north of Binh Ba. B Coy was reacted to this threat with tanks and APC’s but this assault was halted when it was discovered that civilians were caught in the middle. The Vietnamese District Chief and CO 5RAR agreed that the subsequent clearing of Duc Trung would be conducted by Vietnamese Army forces. Up to 80 enemy were sighted just north of Duc Trung and suffered many casualties when they were engaged with the artillery of 105 Fd Bty from Nui Dat and bushranger gunships. By 1700 hours D Coy had completed its sweep to the eastern side of Binh Ba. On the morning of 8 June after occupying a night defensive position, D Coy made a final sweep of the houses on the eastern side of Binh Ba. This concluded the battle and subsequent actions were taken by the Australian Task Force to restore the village and resettle the displaced villagers. The Battle of Binh Ba was significant in that it was one of the few times Australian troops had been involved in village fighting and was certainly the largest battle of that type. It was a classic example of the combined arms capabilities of the Australian armoured, artillery and infantry assets with gunship support. The battle was also notable in that the infantry elements were mainly led by NCO’s and soldiers. Only two officers were part of the D Coy assault force, the OC and one Pl Comd who was wounded. The lack of casualties to Australian troops is testament to the standard of training, sound leadership and aggressive battle discipline displayed at junior levels. It was also the last time that strong North Vietnamese and Viet Cong forces ventured into Phouc Tuy Province. Unit: 1 Armd Regt, 3 Cav Regt and 5RAR were awarded Regimental Battle Honours. Medal, one Distinguished Flying Cross, two mentioned-in-despatches. You require Adobe Reader for this download. Click here do download for free.